Kids in Discipleship (K.I.D.) began as a ministry of the Collegedale Seventh-day Adventist Church in 2002, and transitioned to a ministry of the Georgia-Cumberland Conference of Seventh-day Adventists in May of 2011. K.I.D. continues to be dedicated to equipping parents to spiritually nurture their children to have a personal, meaningful, and fruitful relationship with Jesus Christ. Most parents today don’t have a problem spending time with their kids when it comes to sports, homework, and other daily routines, but they find problems spiritually connecting with their kids. When it comes to faith and spirituality, many parents don’t know where to start. K.I.D. is a ministry that both calls parents back to their children and equips them on how they can disciple their children to Jesus Christ and build faith in the home. K.I.D. 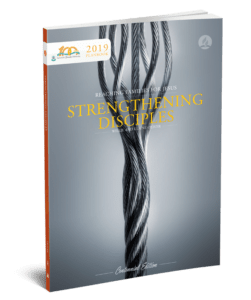 takes a systematic approach of creating relationships with the home, church, and school to help implement discipleship principles that will build a child’s faith to become a lifestyle. The Kids In Discipleship ministry equips church congregations, parents, and key mentors to implement the Deuteronomy 6 model of discipleship that will help foster a family’s ability to use their gifts for worship, ministry, and mission. Through interactive small groups using K.I.D.’s Footprints curriculum families learn to reconnect with each other and build strong personal relationships with Jesus Christ.